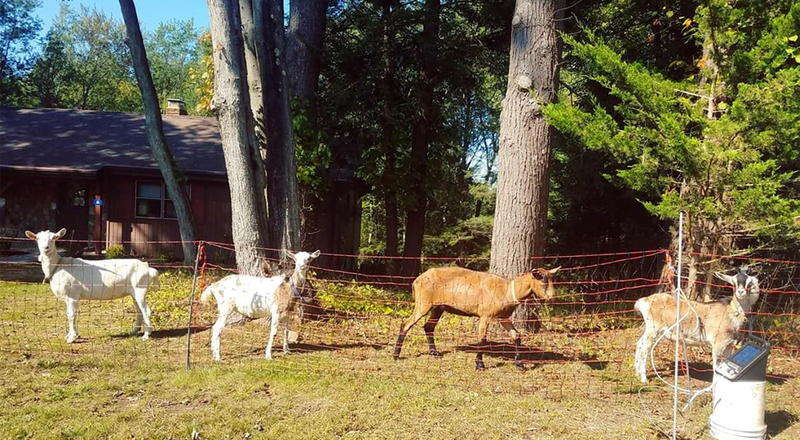 Goatscaping is a natural and organic way to rid your property of noxious weeds and brush including poison ivy, poison oak, sumac, raspberry, briers, and brambles. Depending on the quantity of goats, they can clear up to an acre of brush in a week. Upon first phone call, we will meet on site to assess the property and area that needs clearing. Certain weeds and plants are toxic to goats, so not all areas can be cleared and sometimes certain ones needed to be barricaded off. We will then clear a two foot wide area if possible, and set up a small electric net fence to secure our goats safely. We will leave a small hut or trailer, if possible, for our goats to stay the night. The goats will arrive and go straight to work! 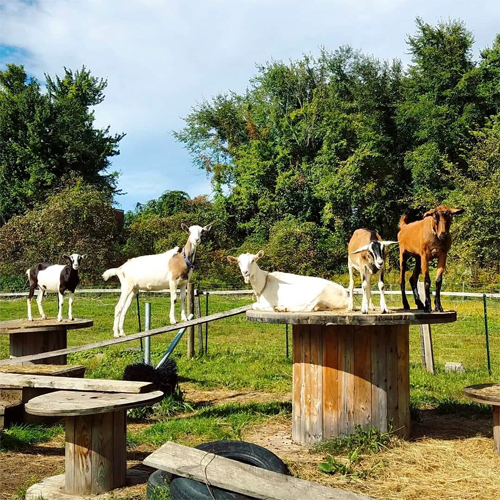 Our goats are rented out for a week at a time for the rate of $750-$850 per week depending on the area, which includes set up. In most cases we will remove the goats at night and return the next morning, which is included with the price. If they finish early you would still be charged for the full rate. Unfortunately with the time consumed with moving the net fence, they cannot do two areas in a single week. What are the advantages vs. chemical? Goats will eat everything they can reach up to ¾” diameter sticks and twigs with greenery off of the evasive plants. While chemicals will eliminate it quickly, there is an added risk with spraying chemicals into the environment, especially for pets and children. Our goat droppings are all natural and very high in nitrogen, essentially fertilizing the area in which they clear. Also the goats are cute to look at! Are there any disadvantages vs. chemical? The only disadvantage is the chemical will destroy the root system to the brush. The goats will just remove the green, sending the plant into shock. This will essentially keep the plant from growing back, but in some cases the goats may need to come back out if there is any re-growth to take care of it one last time. The goats may not be able to take care of all areas. If there are too many poisonous plants in the general area they would not be able to work there. Goats do not eat grass, so do not plan on placing them in an overgrown field, or grassy areas. 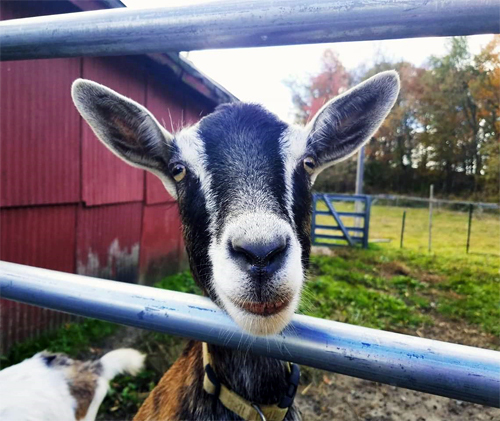 Goats are very curious and may try to escape, but all of our goats are collared for easy grabbing, and if our herder is gone, will be just a quick phone call away to come back and herd them up. We will leave some grain on site in the event you need them to come back.